J.K. Rowling certainly does not want the Harry Potter popularity to wane – even after the extraordinary success of the film series and The Wizarding World of Harry Potter. 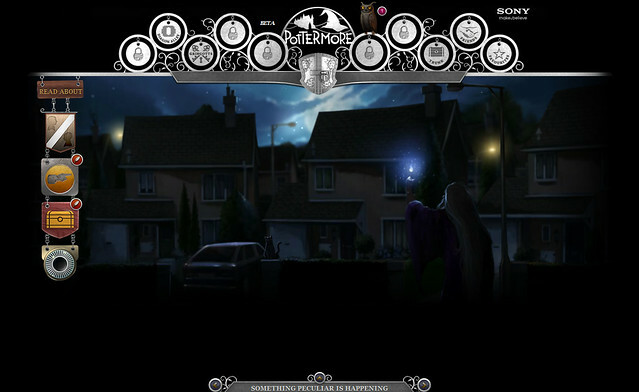 Her latest project, Pottermore, is an online experience developed with Sony. The website was described as an extension to the 7-book series, providing not just new supplementary reading materials, but also an almost immersive world for fans to role-play in. Part of the start-up hype was a 7-day campaign called the “Magical Quill Quest” where 1 million hopeful wizards and witches could register to become an early access user. 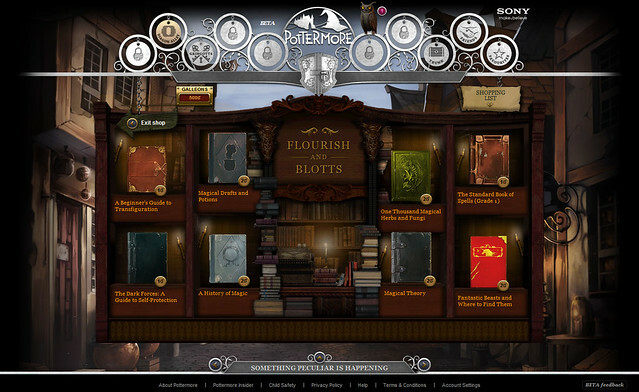 From 15 August 2011, Pottermore has rolled out invitations to a small amount of users. After about 13 days, the number of players are just above 78,000. 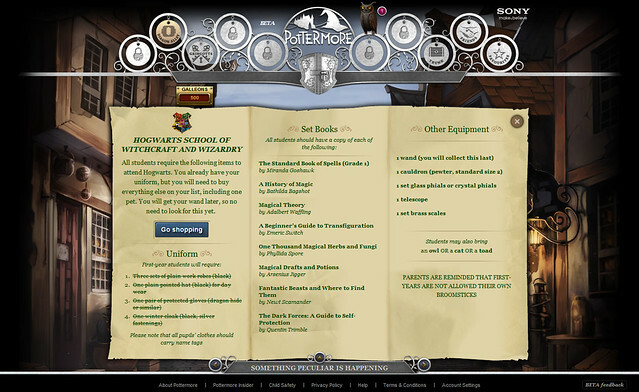 Pottermore is expected to be open to all in October 2011. I was not exactly optimistic about getting early access as I usually have poor luck for lucky draws. 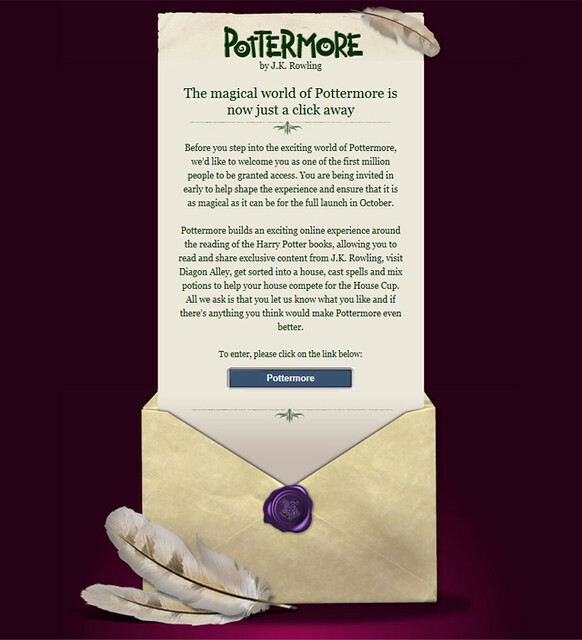 Due to sheer dumb luck (as Professor McGonagall might say), I received a welcoming letter from the website stating that I can explore Pottermore. After completing the main story experience, I’ve decided to write a short review about Pottermore and explain (without spoiling too much) how some parts of the website works. In Pottermore, each book is divided up into chapters, and key Moments in those chapters are highlighted as explorable scenes. Most scenes are animated artwork that has exactly three layers of depth. Users can shift between each depth layer either by double clicking or using arrow keys on the keyboard. Objects can be discovered in the scenes and they can either be extra Galleons, potion ingredients, books, keepsakes or random objects – all can be collected into one’s trunk. One of the memorable scenes from Chapter 1, where Dumbledore would use his Deluminator (Put-Outer) at Privet Drive. You can hover over most parts of the artwork and things will start animating. I am not going to post any more screenshots to keep most of the website a surprise for all. Most of the artwork are faithful to the books and there are a lot of detailed animation happening in each scene. You have to explore the chapters sequentially, no skipping to the end! Some chapters are locked until you perform a certain action – it’s fairly obviously where most of these occur if you’ve read the book. You might notice a column of icons on the left. These are links to articles about the Harry Potter Universe – Characters, Places, Artifacts and Animals. 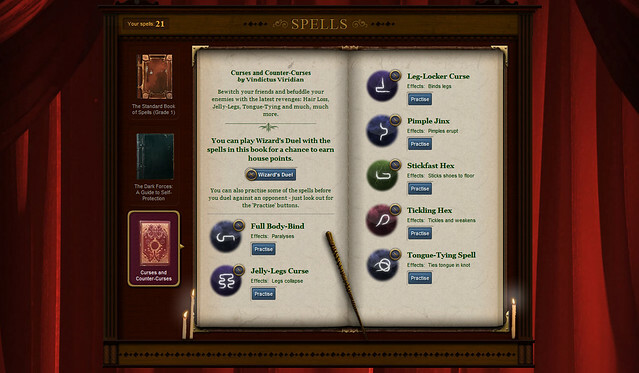 Some clickable objects will unlock new material written by Rowling for Pottermore, marked with a red quill icon. Users can leave comments at the end of each chapter – though most of them are on the lines of “add music please” or “more interactivity” suggestions. While the story experience takes place in the same point of view as the books, each Pottermore user could start their own stories by participating in the roleplaying portion of the website. That is, to be like a student at Hogwarts. The journey begins from Diagon Alley (like Harry’s first visit) where you will have to do a lot of shopping for school needs. First you need to set up your Gringotts account. Sorry, no fancy ride here. 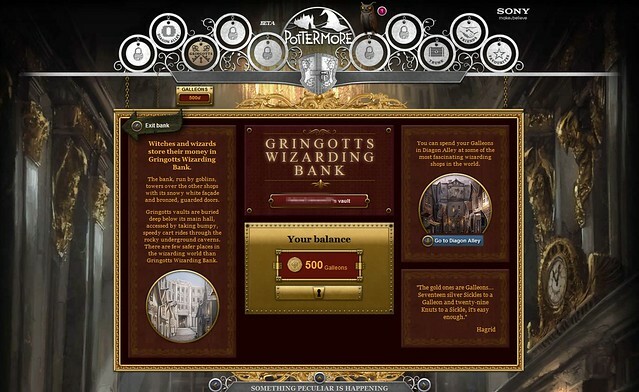 Allowance for all users is 500 Galleons, to last until the release of the next book in Pottermore. Unlike the story, Diagon Alley (and actually every other location) can be revisited at any point of gameplay. It is the only location where items, such as potion ingredients and wands, are sold. There are two very important moments in Pottermore: Wand Choosing at Ollivander’s and of course, the famous Sorting Hat Ceremony at Hogwarts. Both moments are simply 7-question quizzes, but it is a one chance deal and decision is final. Yes, Rowling believes that her 7-question tests are more discerning than any psychometric tool available in the muggle world. You have to accept the results – perhaps there was an undiscovered personality trait you never knew, or something. Obviously, there have been countless dramatic reactions to the Sorting hat’s decision, but take it this way – this is J.K. Rowling’s Sorting Hat. Whatever it says, stays. Well, you can always sign up for a new account and “fake it” but really, the whole point is to be frank with your answers, just have faith in it, and embrace your new-found magical identity. I am not sure if the wand has any influence on gameplay, such as casting spells. Houses at Hogwarts however, are as important as in the books – Houses compete for the House Cup and players will have various opportunities to earn (or lose) points for their houses. Points can be gained for exploring scenes and finding objects, brewing potions and dueling a student from another house. 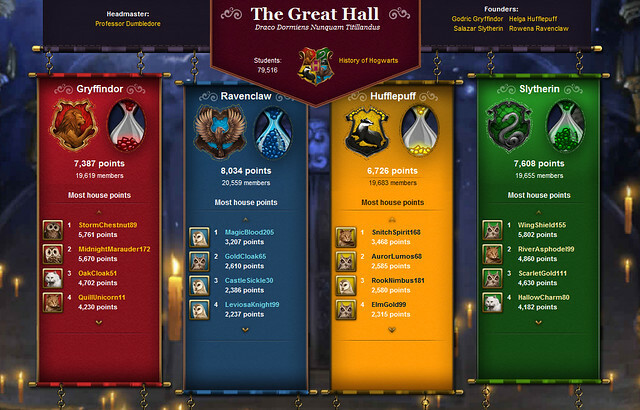 The Great Hall is the leaderboard in Pottermore. Click for a larger view to see how many students have enrolled into Hogwarts and the size of each House when this screenshot was taken. The story can be completed fairly quickly, since only Book 1 (Harry Potter and the Philosopher’s Stone) is available and it is the shortest book in the series. 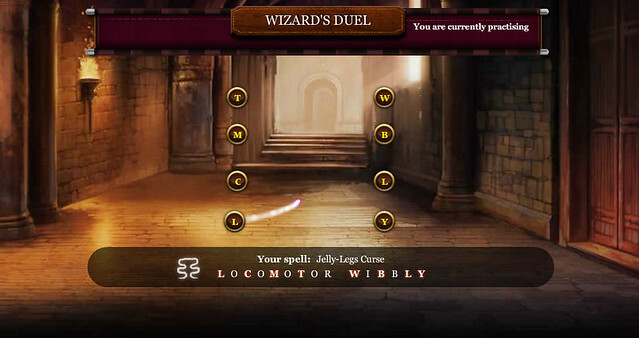 Users can then focus their time on remaining activities such as Potions and Wizard’s Duel. Hmm, needs more snake fangs. Brewing potions is what I can describe as “Cooking Mama” style of gameplay, except Mama is not going to hold your hand throughout the process, and neither will Professor Snape – although I think no one would want that either. Recipes can be found in a Potions textbook (only one for now and it’s the compulsory purchase from Diagon Alley) and basically, that is it. As long as you have the ingredients (buy from Diagon Alley or find them in Moments), a serviceable cauldron and time, you can start brewing potions. Funny thing here, although it was clearly stated by Snape that there is “no foolish wand-waving” in Potions, you have to wave your wand to complete a set of instructions. Potions can be challenging, as instructions have to be followed PRECISELY and completed within a time limit. 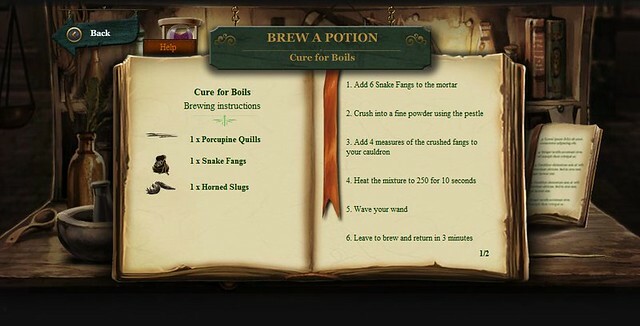 The potions will then need to be left to brew for quite some time – an hour and longer. 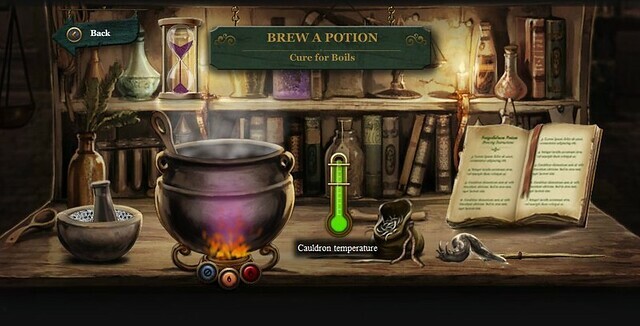 This can become frustrating when the server goes down for maintenance or some glitch occurs – causing the potion to brew incorrectly (lose house points and waste ingredients), or worse, an exploding cauldron. This means that Potions could become very expensive.. but wait, actually it already is. You see, you only gain house points for brewing potions correctly. You can’t do anything with potions, apart from gifting them to friends. There is no way to earn Galleons in Pottermore except for the handful one-time appearances scattered throughout Moments. Unfortunately I cannot comment about Dueling because it has not been working properly, or at all. 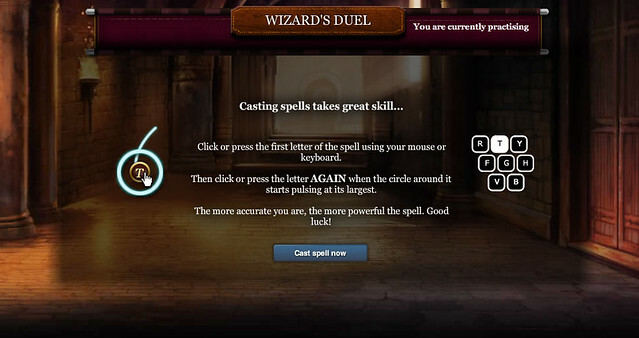 It is supposed to be a turn-based dueling game where two players cast spells and the better performer will win. Spells are performed by pressing a key in time with wand movement. A line would appear and as it touches a letter, players will need to click it or press the key, causing a circle to appear. Players should keep the pulsing circle as large and as centered to the letter as possible. The line then travels to the next key and – you get the picture. It takes a while to learn the right timing but spell casting is a lot simpler. Best of all, it doesn’t cost galleons. No, you won’t be learning unforgivable spells. Some spells can only be unlocked by discovering new books, so keep an eye out when exploring the scenes! Pottermore can be a rather short experience, especially if you are not into staying for tasks like Potions and Dueling, or perhaps not exactly motivated to compete with your House for the House Cup. I went exploring the story scenes very slowly and it took about 1.5 hours to finish the materials from Book 1. Then again, this is designed for Harry Potter readers of all ages, so obviously most features need to be kept straightforward. I have not mentioned this, but a fast connection and relatively up-to-date computer is required to experience Pottermore. Most pages are image-heavy and often filled with Flash elements. Pottermore is obviously not optimized for any tablet devices, at least for now. In short, here’s what I think. – Seamless integration of Flash and amazing use of CSS. While yes – this is beta, and problems do exist all the time and can be fixed… The developers have less than 5 weeks to resolve issues and put in all the other features for the October launch. I have intentionally left out details in this review. If you do have any questions about Pottermore, such as where to find ingredients and similar, feel free to leave a comment. Pottermore actually works pretty well on my iPad.